Last spring I partnered with Turning the Wheel (TTW), a non profit dedicated to building community through creative expression, to create “The Good Box,” a magical deck of cards with little notes of goodness on each one. The deck was designed using snippets of art I had created over the past three years. The sayings came from the loving genius of Holly Lewis, who created the first good box from scratch a few years ago. At TTW we all felt the idea was so simple, brilliant, and fun that it had to be shared with everyone, so we got to work and ended up with this wonderful deck of mini-cards. I’ve already heard some great stories from people who have been enjoying their deck. One friend keeps a deck in his truck, and before he leaves for a job he draws a card to come back into his body. Another was given to a local doctors office, and when the giver returned, the receptionist insisted she drew a card before sitting down to wait for her appointment. I like to share them at family gatherings and love seeing the reactions people have to the sweet little sayings on the cards. Reading the sentences about goodness never fails to leave a smile on a the readers face. For the whole month of February, TTW and I celebrated with the “Month of Goodness” Campaign. Individuals could sign up and receive snippets of goodness in their inbox each day. The campaign included TTW activities, positive quotes, beautiful art from members of the TTW National Team, and fun videos. You can check out some of the posts from the first week here. TTW plans to do the campaign again, so if you are sad to have missed it – No Worries! You can sign up for the next round here, it’s free. Or you can buy your very own Goodbox! I’m so thrilled to have a product that people can take home and enjoy over and over again. If you decide to pick one up let me know what you think! Last time I blogged about anything was a while ago, and back in November I only talked about half of my trip to California. Since then I have made a lot more art, and been to a couple more places around the country. However, before I talk about all that I felt I should finish discussing my adventure in LA. ORIGAMI! If you have never played with folding some paper into fun shapes I recommend you give it a try. I love folding origami, and although I only know three shapes to any level of proficiency I want to learn more. Our art project with the High School student’s in LA was origami, and we used the numerous pieces to create a wonderful set for their final performance. The elementary students also made origami, but the majority of their set was also made by the high schoolers. In about 1 hour 45 minutes the 60 students we worked with cranked out over 600 pieces of origami. It was awesome! We made three shapes: The Cootie Catcher/Fortune Teller, the Pinwheel, and the Lotus. The 3 shapes are relatively easy to learn and sort of build on each other. I taught everyone how to fold from the front of the class. I think I could fold the three shapes in my sleep. After all the shapes were made we took them home and strung them on strings. Some the shapes were stacked into lanterns- pinwheels on the bottom, fortune teller in the middle, and the lotus on top. I think it looks like a whole flower and they spin in the wind which is a great effect. The students each took a lantern home with them after the performance. On our final day of the trip we had some free time. During my free time I visited the Getty Museum. The Getty is perched at the top of one of the hills surrounding Los Angeles. You have to take a tram up the side of the hill, winding through greenery and gardens to get to the actual museum. And once you step off the train you have to ascend a grand white marble staircase. The Getty has no qualms about putting art of a pedestal and I was pretty impressed by the grandeur of the entrance. 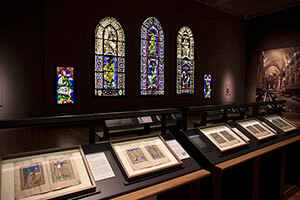 I only had a short amount of time to visit and I really wanted to see their illuminated manuscripts and stained glass. As it so happened the day I visited they had a temporary exhibit up on the Cantebury Tales, filled with rare and exciting manuscripts and windows. Illuminated Manuscripts are hand made documents intricately painted with beautiful inks, and are often focused on religious themes. They began appearing as early the 6th century and were still being made as late as the 16th century. To learn more about illuminated manuscripts you can go here. 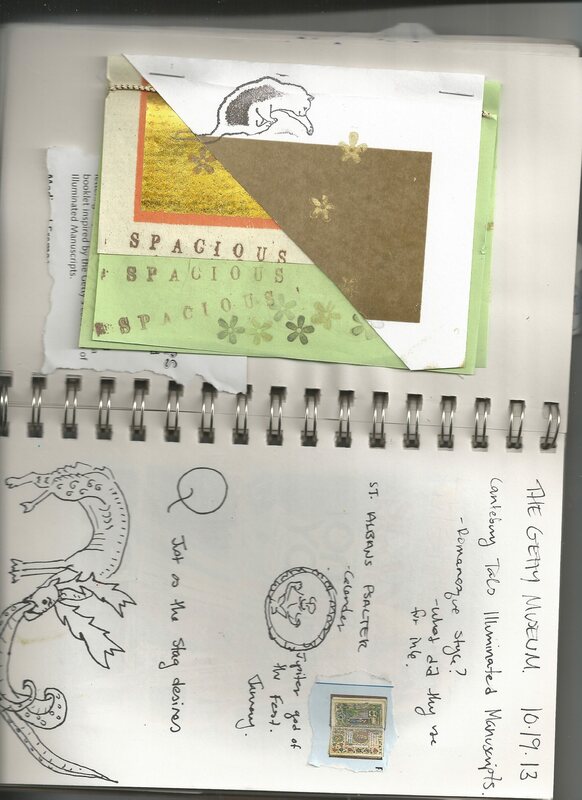 I enjoyed sketching the strange images found on many of the pages. Cameras were not allowed in the exhibit so I had to capture inspiring images on paper in ink. This sketch was done in about 5 minutes and I loved the deer eating the octopus. It was such a bizarre picture that I couldn’t pass it by. The day I visited also happened to be part of the Getty’s children’s weekend. As part of the festivities they had a live medieval band playing and an art station for children. The project was to make an illuminated manuscript of your own to take home. I was allowed to make one even though I’m not a child anymore. It is pictured above next to my sketches from the exhibit. We were given a pile of papers of various colors and textures and then had access to numerous stamps and inks. Again, pressed for time, I quickly through something together as a momento of my time at the museum. I just let myself be drawn to colors and images and words that I liked. That was the final artistic endeavor of my trip to Los Angeles. I will be back in LA in March to be a part of a major theater production, “I Knew That Once”! At Women’s group last we played with Alcohol inks and Yupo paper. The affect you get when dropping the inks on the paper is really cool. The inks spread really easily across the paper, which creates a lot of movement and vibrant color. Before we made this piece we we meditated on water, the fluids of our bodies, and how to flow through life. The intention of the art project was to let the colors and inks flow without trying to “create” something. There was also this citrus solution which softened and manipulated the color of the ink. After we had created our pieces we were asked to look and see what appeared in the image, like a colorful and elaborate ink blot. I immediately saw a stormy chinese dragon. After talking with my mentor she explained that Chinese Dragons often represent feminine power. I think it is a fitting image for where I am in my life, recovering from the flood and my own tumultuous inner landscape. What do you see? Feel free to comment below. Made in a Heartdance from a LONG time ago. I think this one was about spiraling into my sexual power and remembering how cool I am on a regular basis. I still love the spiral. Its in a picture frame now, so I suppose I could pull it out and read what the other side said.